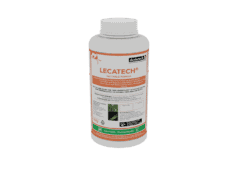 LECATECH ® WP is a biological insecticide containing Lecanicillium lecanii, a naturally occurring Entomopathogenic fungus that is effective against whiteflies. LECATECH ® formulation contains conidia of Lecanicillium lecanii strain J27 at a concentration of 1 X 1010 spores per gram in an inert carrier. Upon germination of the spores of Lecanicillium lecanii, the germ tubes penetrate the cuticle of the insect by enzymatic and mechanical actions eventually infecting the insect. The fungus then destroys the internal body contents resulting in mortality of the insects. Larvae and pupae die before the fungus is visible. Dead larvae and pupae of infected insects have a wrinkled non-shiny surface with a light to dark yellow colouration. Under favourable conditions white fluffy fungal mycelium appears on the infected organism growing best at 18- 30° C and relative humidity of above 65%. Mix the required amount of LECATECH ® with water using 2 litres for every 250g product; stir well to form a uniform suspension. Add the suspension to the required volume of water in the spray tank and mix well. Add in an appropriate wetter in the recommended rates and mix thoroughly (information on the appropriate wetter may be obtained from Dudutech). After mixing with water the product should be sprayed as soon as possible; DO NOT store overnight. Thorough coverage of the leaf surfaces where the insects are to be found is imperative to obtain good efficacy. Apply using High Volume Spray equipment. Maintain a minimum Relative humidity of 70 % for at least 12 hours. Highest infection levels are achieved at temperatures of between 20 -28°C. Curative spraying should be done at intervals of 5-7 days of between 2-4 applications. However this will vary with the pest pressure. It is recommended to apply LECATECH ® at 250g per hectare with a water volume of 1500 – 2000 Litres depending on crop canopy with the aim of having the fungal spores evenly distributed on the leaf surfaces.